The participants entered Iriyuji-gama cave, a historical battle site in Gushikami, Yaese Town, on August 21. A non-profit organization called shizen taiken gakko (Nature Experience School) Okinawa branch in Yaese Town held a clean-up event at a battle site in Iriyuji-gama cave in Gushikami, Yaese Town, on August 21. 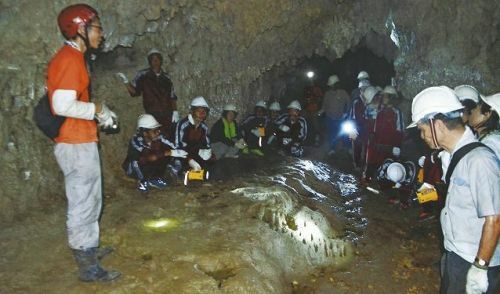 Twenty-seven participants from Gushikami Junior High School and the general public attended the event to clean up litter around the cave and to learn about the local historical battle site. The Iriyuji-gama was used by soldiers belonging to the Japanese Imperial army as the headquarters for the 5th troop from the 89th Infantry Regiment. The cave was also used as a storage space for documents from the Gushikami village office. Seventy-one years after the war, the cave is still not well known among the neighboring residents, and it has been degraded by illegally dumped waste around its entrance.